Some of you may already sense that a turbocharger on a car or truck engine is essentially a very small gas turbine. It uses engine exhaust energy to compress air into the engine, thereby increasing the total air flow through the engine and the possibility of burning more fuel in the same cylinder volume ... and thereby increase the amount of power out of that engine. It shouldn't be surprising then that manufacturers of turbochargers thought about the possibilities of using a high-speed generator on the same shaft of the turbocharger to produce electricity. Two major suppliers are currently entering the distributed generation market with these designs. The equipment from Capstone is currently a 28 kW generator and the one from Allied Signal is 75 kW. Both use turbocharger designs from vehicular engines and high-speed DC generators to produce electricity. These DC sources are then converted to AC using inverters, similar in design to the same concepts used in uninterruptible power supplies for computers. The theoretical advantages of these devices are compelling. There are relatively few moving parts and the power-producing module "floats" on air bearings. Since there is no metal-to-metal contact, this design could be a long life and lower friction loss concept, and should result in relatively low maintenance expense. While the purchase price for microturbines is still much higher than spark ignited engine designs of the same size, their lower noise levels and attractive packaging have created a stir in public opinion and interest. Remember that these are the devices highlighted in the Business Week article enumerating this as the No. 1 item in their list of 21 great ideas for the 21st century. However, installed cost is an issue. At this time, the typical installed cost for the 28 kW machine is about $1,400-$1,700 per kW and $800-$1,000 per kW for the 75 kW machine. And, the effective price for these machines at the actual production of power on the hot summer day is much higher due to the much reduced power levels. For example, the Capstone machine produces only 23 kW at 100°F air inlet temperature. 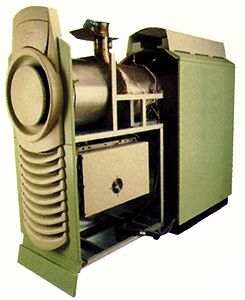 The theoretical efficiency looks reasonably attractive in comparison to larger gas turbine designs, and is achieved using heat recovery (recuperation) of the exhaust to preheat inlet air. However, final guaranteed performance figures are not as yet available, and field tests have failed to live up to the claims in the early public announcements. Perhaps the most important aspect of Allied Signal's plan is their use of Honeywell (a subsidiary company) as a maintenance partner and the use of modular components produced in high-volume for other applications. In addition, Allied Signal has signed up an impressive array of sales partners (mostly electric utilities) to support their market penetration efforts. The first production units are going into service (once again, mostly at electric utility research sites) in the 1999/2000 time frame and will be carefully scrutinized by everyone in this business. This is truly the only new, large-scale product introduction that could change the energy landscape in the near term.